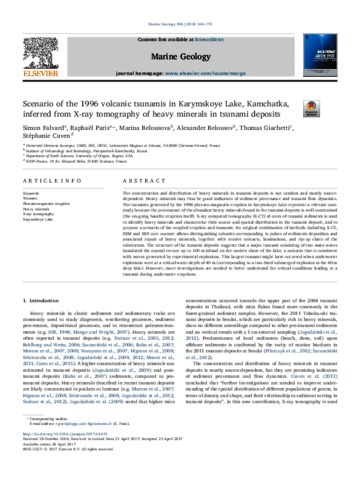 A subaqueous eruption in Karymsky lake in the Academii Nauk caldera dramatically changed its water column structure, water chemistry and biological system in less than 24 h, sending major floodwaves down the discharging river and eruption plumes with ash and gases high into the atmosphere. 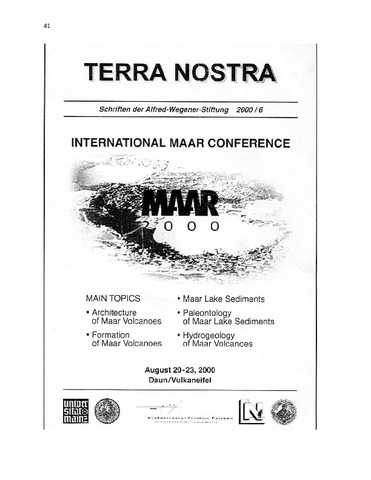 Prior to the eruption, the lake had a pH of about 7, was dominated by bicarbonate, and well stocked with fish, but turned in early 1996 into a stratified, initially steaming waterbody, dominated by sulfate with high Na and K levels, and devoid of fish. Blockage of the outlet led to rising waterlevels, followed by dam breakage and catastrophic water discharge. The total energy input during the eruption is estimated at about 1016 J. The stable isotope composition of the lake water remained dominated by the meteoric meltwaters after the eruption. 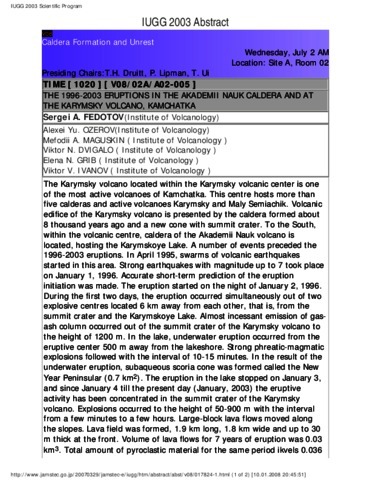 Data are presented from studies of volcanoes in the Karymsky long-living volcanic center, Kamchatka in 1996. We examine the dynamics and rock composition for eruptions that started simultaneously on Karymsky Volcano and in the Akademia Nauk caldera. The effusive-explosive eruption of Karymsky Volcano was resumed after a 14-year repose period, producing about 30 million tons of andesite-dacite discharges through the summit vent. 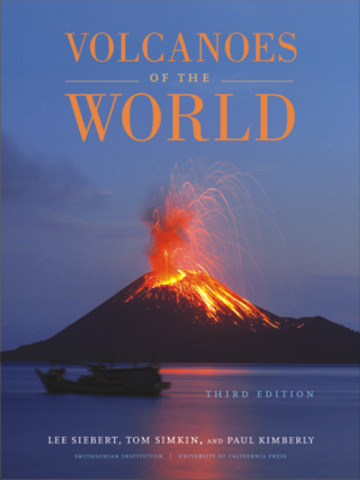 Long-continued eruptive activity of that volcano is supposed to go on during the near future. Simultaneously with this activity, typical of Karymsky Volcano, a subaquaceous explosive eruption was observed in the lake that occupies the Akademia Nauk caldera 6 km south of the volcano for the first time in Kamchatka during the historical period. An edifice arose in the northern part of Lake Karymsky during 18 hours of this eruption consisting of basaltic and basaltic andesite pyroclastic material surrounding a crater of diameter 650 m. The amount of erupted pyroclastic material is estimated as 0.04 km3, the total weight being over 70 million tons. 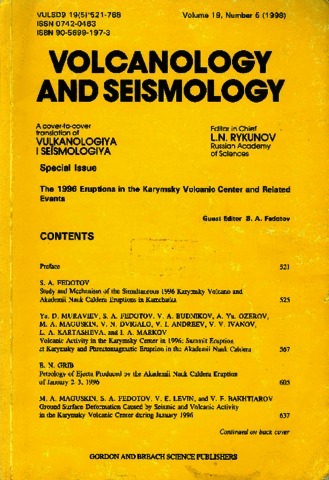 A discussion is provided of the impact of these eruptions on the environment; we describe renewed hydrothermal activity and the formation of a new group of hot springs in the Akademia Nauk caldera, and estimate the possibility of breakthrough floods from Lake Karymsky etc. Представлены материалы исследований деятельности вулканов Карымского долгоживущего вулканического центра на Камчатке в 1996 г. Рассмотрены особенности динамики и вещественный состав пород одновременно начавшихся извержений вулкана Карымский и в кальдере Академии Наук. Эффузивно-эксплозивное извержение Карымского вулкана возобновилось после 14-летнего периода покоя и в течение года поставило через вершинный кратер -30 млн.т вещества андезитодацитового состава. Предполагается длительная эруптивная активность этого вулкана в ближайшие годы. Одновременно с типичной для Карымского вулкана активностью в 6 км южнее впервые на Камчатке в историческое время наблюдалось субаквальное эксплозивное извержение в озере, занимающем кальдеру Академии Наук. За 18ч извержения в северной части Карымского озера выросла постройка из пирокластического материала базальтового, андезитобазальтового состава с кратером диаметром 650 м. Объем извергнутого пирокластического материала оценивается в 0.04 км3, общий вес >70 млн.т. Обсуждены последствия извержений для окружающей среды, описаны оживление гидротермальной деятельности и образование новой группы горячих источников в кальдере Академии Наук, сделаны оценки прорывных паводков из Карымского озера и т.п.